Can you believe that the Energizer Bunny is soon to celebrate its 25th birthday? Don’t worry about him slowing down with age because this adorable pop icon is still going strong and he is full of positivenergy™! Whenever I see the Energizer Bunny it always put a smile on my face because he is just so cute and epitomizes the Energizer® brand perfectly. 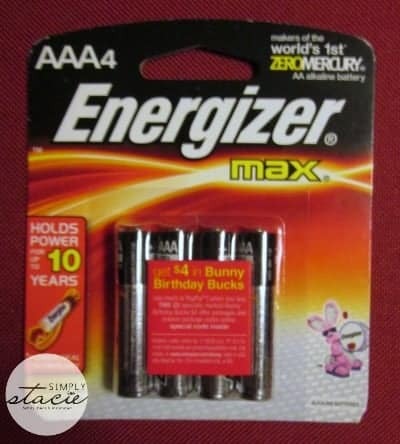 In order to help the Energizer Bunny celebrate his very special birthday, Energizer® is offering consumers Bunny Bucks along with the Energizer Bunny Birthday Sweepstakes. What are Bunny Bucks? Whenever you purchase a specially marked package of Energizer batteries you will receive a special code that can be redeemed to turn into money as a check or as a deposit into a PayPal account. I received two specially marked Bunny Bucks offers on Energizer AA and AAA batteries. It was very easy to fill out the form online and I requested to receive my special Bunny Bucks back via my PayPal account. To keep the party going strong throughout the year, the Energizer Bunny will also be offering “party favors” which are coupons you can use on your next Energizer purchase! I also enjoy entering sweepstakes (though I have yet to win big it is still a lot of fun trying) and look forward to entering the Energizer Bunny Birthday Sweepstakes. Running through December 5th 2013, you can enter for a chance to win one of 25 fabulous birthday prize package filled with Energizer batteries, portable lighting solutions and a gift card (SRP approximately $75)! So, hurry over the Energizer Bunny’s Facebook page to wish him a Happy 25th Birthday and enter for your chance to win! Energizer batteries are always my first choice for all of our battery needs and I will be sure to stock up for the holidays. I am also heading over now myself to wish the Energizer Bunny a “Happy Birthday” and enter the Energizer Bunny Birthday Sweepstakes………………….. I learn about kid swallowing coin button batteries. Energizer is serious about recycling used batteries. I learned about recycling used batteries. I learned they have laptop chargers. They also have laptop chargers.Cool idea. I love their flashlights, great quality. I learned you can recycle used batteries, which I never knew! Energizer is the first in the industry to eliminate Heavy Metals from their products. I’d like the Energizer® XP8000A. I like the hearing aid batteries, because my son uses them. I would love to own the Energizer® Folding Lantern with Light Fusion Technology! I think it would be good for camping trips & for when we loose power at home! I definitely would like to have and need a generator. never knew they had chargers until now. I would like to have the Energizer LED Folding Lantern with Light Fusion Technology. I would like to have the Energizer Solar LED Spotlight. I’d never really thought about recycling old batteries before. We’ve always just thrown them out. That sounds cool!